Internal network. 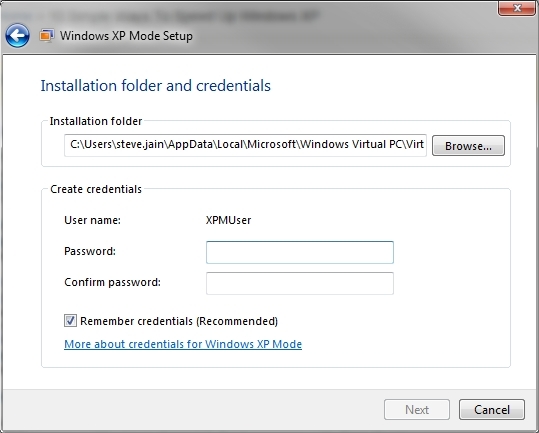 This option provides networking between virtual machines only. This type of network connection is useful when you want to provide a networking communications channel to the virtual machines on one physical computer while isolating the virtual machines from all external networks, both wired and wireless, as well as the host operating system. <Network adapter name> (on host operating system). This option is sometimes referred to as “bridged mode”. It uses a physical network adapter to connect the virtual machine to a physical TCP/IP-based network as a separate computer. The virtual machine appears and operates like a separate physical computer on the network. You use this option by selecting the name of the physical network adapter that is connected to the network you want to use. You can choose from both wired and wireless network adapters. Shared networking (NAT). 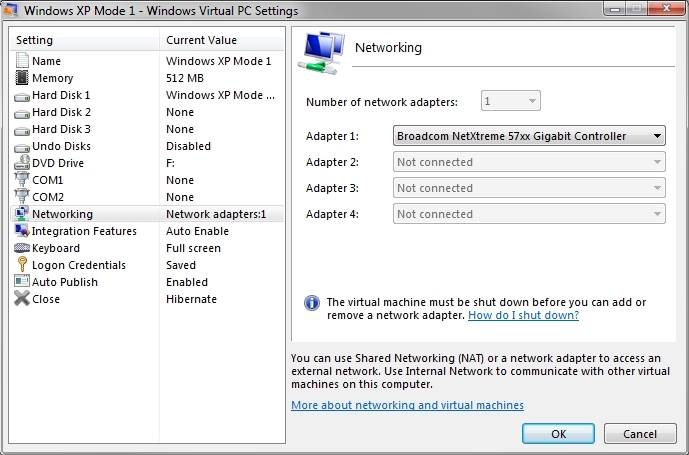 This option is available for the first network adapter in the virtual machine. It allows the virtual machine to share one connection to a physical TCP/IP network with the host operating system. When you use this option, the virtual machine is not listed as a separate computer on the network. This is useful if you regularly move the host between different network configurations, if you want to connect the virtual machine to the Internet through a broadband or dial-up connection used by the host, including a virtual private network (VPN) connection, or if there is a shortage of IP addresses. However, performance is not as fast as the performance offered by bridged mode. If the Windows 7 host uses a wireless WAN (WWAN) device to connect to the Internet and you want a virtual machine to be able to use this connection, you must configure the virtual machine to use shared networking (NAT). A network adapter that is disconnected from all available networks is listed as Not Connected. You can connect a network adapter to a network regardless of the state of the virtual machine. However, a virtual machine must be off before you can add or remove a network adapter—it cannot be running or hibernated. For information about closing a virtual machine, see Close a virtual machine. In the left pane of the Windows Virtual PC Settings page, click Networking. To add or remove a network adapter, click the new number of network adapters you want. When you add a network adapter, it is disconnected. To connect the network adapter to an available type of connection, select it from the drop-down list next to an available network adapter. Caught! The elusive XP Mode password window! After reading dozens of threads where the poster says there was a never a prompt for them to enter a password for XPMode, I’ve finally tracked down this elusive beast while setting up my new work laptop. Notice how the Next button is grayed out? You can’t proceed with the install until you enter a password.